Eurol introduces motorcycle additive line | Eurol B.V.
Eurol launches a fuel additive line especially developed for motorcycles. The product range consists of four products: Eurol Motorcycle Fuel Treat, Eurol Motorcycle System Cleaner, Eurol Motorcycle Octane Booster and Eurol Motorcycle Injection Cleaner. These additives do not only solve existing problems, but also work preventively. Eurol Motorcycle Fuel Treat prevents fuel degradation during seasonal or prolonged storage by improving the fuel oxidation stability. It protects against gelling, lacquering and corrosion in the fuel system. Eurol Motorcycle System Clean counteracts the effects of a lower quality fuel. Additionally, it works with extra protection for smaller engines that are more susceptible to pollution and engines that often drive short distances. Eurol Motorcycle Octane Boost increases the octane number in gasoline with 4 to 6 points. The engine feels more alive and at a constant rate, fuel consumption will decrease. It prevents engine pinging, provides extra power and lowers fuel consumption. Eurol Motorcycle Injection Clean cleans contaminated injectors and improves fuel spraying. It removes carbon deposits and pollution on fuel lines, fuel distributors and injection inlet valves. It provides better ignition and swiftly running of the engine. The purpose and necessity of using additives is increasing. Because of the rising percentage of biological components in fuels, shorter rides, more refined engine technology and longer oil change intervals, there is a greater risk of engine pollution, with lesser engine performance, poor ignition, higher consumption or extraordinary smoke development as a possible result. The Eurol motorcycle additives provide longer engine life, less wear, more engine power, lower repair costs, lower fuel and oil consumption and lower emissions. 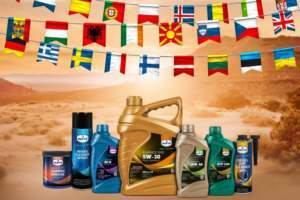 Eurol introduces a top-quality additives range. At the Automechanika trade fair in Frankfurt from 16-20 September, the extended range was presented for the first time to the international public.